The Two Mashatus semi-permanent base camp is located near the confluence of the Limpopo and Majale rivers. You ride out daily to explore the surrounding area which is rich with wildlife and bird life, returning to base camp every night. Nestled in the shade of a centurion Mashatu tree, two traditionally built Lala palm rondavels serve as dining area and lounge. Accommodation is in big A frame walk-in tents pitched on teak platforms, with en-suite environmental toilet and hot water shower. Each tent is private and positioned in the shade of a tree with a small deck area on which to relax during the afternoons. 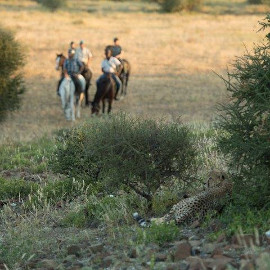 The riding varies but will usually include an early morning game viewing ride and sometimes a late afternoon ride. There are usually also opportunities to go on a game drive by vehicle. They are very flexible with the length of stay and it can be from two nights upwards, although we would recommend at least 4 nights plus, to get a true feel of the area.